My local yarn store, Yummi Yarn, has a sale table this week. Bad news for those of us who pride ourselves on small yarn stashes. This is 4 balls of Debbie Bliss Cotton Angora, $4 each! 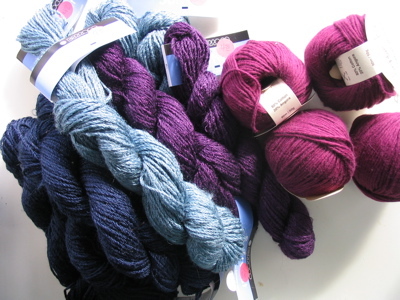 and 10 skeins of Berroco Softwist, (deep breath first) $2.25!!!!! These are all destined to be scarves hopefully before the winter is over. There has been very little knitting accomplished this week. I'm franticly trying to get lots of pots made for the studio tour, and my body is complaining. Looks like I've got to prioritize. Pots first, then the one stealth christmas knit for the year. Wow, cool stash enhancement. Great colors. Ahh. All that yarn just makes me happy. What great colors. I especially love the deep denim blue. I'm a professional potter in Western North Carolina. My blog, however, tends to be more about my kids and crafting. Please visit my website!